Boat fishing over wrecks and reefs with one hook on a long, flowing trace is a deadly and highly sporting way of catching pollack, coalfish and other predators. Pollack and coalfish are the great hunters of wrecks and reefs. They usually harry their prey some way off bottom, so to catch them it’s vital to present a moving bait in as lifelike a manner as possible. The best way to do this is with a single hook on a long, flowing trace. Couple this with light tackle and the result is a thrilling take and an exhilarating battle – both fish are extremely ferocious and possess a remarkable turn of speed. Bass and big red and black bream can also provide exciting sport from a boat over reefs and wrecks using long-trace tackle the key component of which is the simple but devastating Flying Collar rig. The Flying Collar is THE rig for coalies over wrecks. 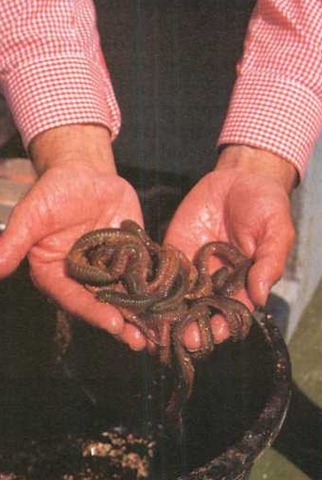 No wonder this angler is so pleased with his fish – it gave him a great fight after grabbing his artificial eel. You’re only using one hook for one fish at a time with a Flying Collar rig, so choose light, balanced tackle for the best sport. Simplicity is essential to the design of this rig. The best boom on the market is the type shown in the photo below – a 23cm (9in), angled length of green PVC tubing. The ends of the tube are fluted to allow it to slide freely without damaging the line. Artificial sandeels of various sizes and colours work well for coalfish over wrecks. They come with the right size and type of hook ready fitted by the manufacturers. Mackerel strip is an excellent natural bait to use with the Flying Collar rig, especially for reef pollack in autumn, but it must be absolutely fresh – ideally caught that day. Two or three fresh, juicy king rag make a very good natural bait to use with a Flying Collar rig when you are after pollack over reefs in early summer. 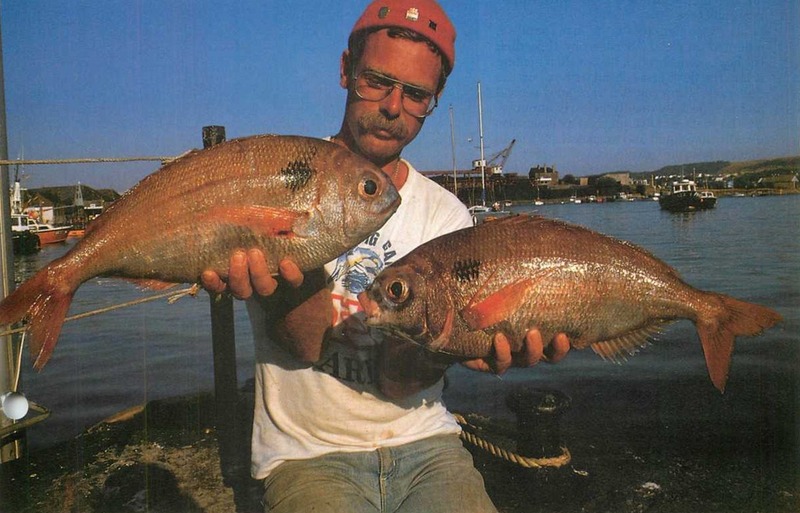 Large black and red bream (below) can be taken over wrecks in summer and autumn with a Flying Collar. Although mainly bottom feeders, they sometimes hunt above wrecks. 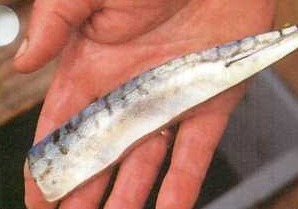 Use a 15cm (6in) squid or mackerel strip on a 2/0 Aberdeen. Live sandeels can also work well for these colourful fish. 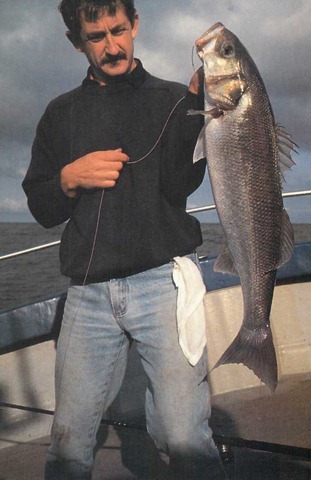 You can catch big bass (below) over reefs in spring and summer on a Flying Collar. 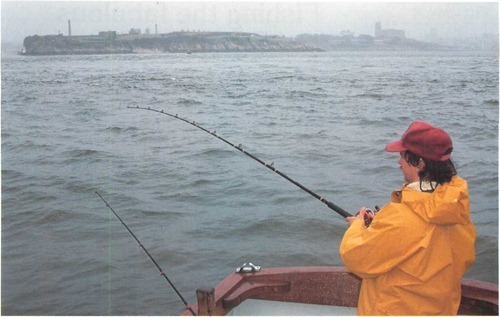 Drifting usually works best, but not haphazardly – during the day the bass tend to stay in deep gullies. Drop your bait (usually a live sandeel, or better still a big live launce, on a size 4/0 Aberdeen) to the bottom, then work it just above the rocks. The take is usually savage, the fight always thrilling, and the outcome always in doubt right up until the moment the fish is safely in the net. The effectiveness of the Flying Collar was demonstrated one day a couple of years ago at a wreck in the south-west English Channel. The wreck was known to hold large coalfish but on this day seven anglers on a top charter boat spent five fishless hours because they ignored the skipper’s advice on how the fish could be caught. With just one hour left the skipper and a photographer (also a very experienced angler) decided enough was enough – and picked up rods. Within five minutes two superb coalfish of 28lb (12.7kg) and 25lb (11,6kg) were on board after taking artificial eels on 16ft (5m) traces. The others quickly changed over from short traces and bottom- fished baits and in the short time left took six fine coalies. Their main mistake had been not to fish a moving bait – big coalfish rarely go for food that is stationary. This rig evolved some 50 years ago and to this day no-one has come up with a better one for taking pollack and coalfish from a boat. It comprises one hook on a 3-5m (10-16ft) trace, above which a weight hangs from a sliding boom. You can buy various types of booms in tackle shops, but many are far too short. The boom must be at least 20cm (8in) long to allow the trace to flow out in the tide. The best one on the market is also the newest. Amazingly simple but highly effective, it is a 23cm (9in) long PVC tube with a bend near the top from which the weight hangs. The boom allows you to lower the long trace to the fishing zone swiftly, without tangling, and the bend is angled in such a way that the trace flows out almost horizontally with the tide. A weight clip allows you to make quick changes of lead size (5-10oz/142-284g) to suit the strength of the tide. Always use conventional, streamlined bomb weights. flat-sided torpedoes and round grip leads offer too much resistance to the tide flow. 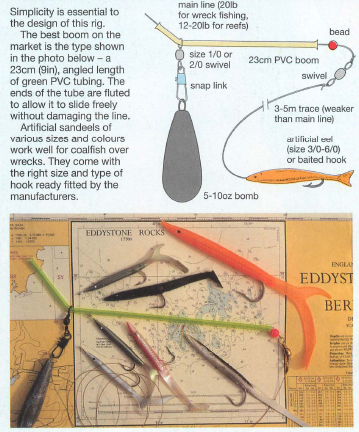 Sporting tackle For wrecks, go for a 20lb class boat rod no shorter than 7ft (2.1m). For reefs, a 7-7V*ft (2.1-2.3m), 12lb class boat rod is best. Match the rods with appropriate size multipliers loaded with mono – 20lb (9.1kg) for wrecks, 12-20lb (5.4-9. lkg) for reefs. Trace mono should always be about 2lb (0.9kg) lighter, to make it less obvious to the fish and to ensure you don’t lose any reel fine if you snag up. Choice baits Natural baits work best over reefs, where the main target is pollack. Live sandeel and the much bigger launce, squid, very fresh mackerel strip and king rag are all good. Mount them on size 2/0-4/0 long shank, black Aberdeens. Artificial sandeels carrying size 3/0-6/0 hooks usually work better over wrecks for both pollack and coalfish. Experiment to find the best size and colour on the day. A strong tide run is essential. Without it the trace cannot flow out and the bait or artificial eel is lifeless. When the tide is moving reasonably fast, a 3-3.6m (10-12ft) trace works fine, but in very strong tides you can use one up to 5m (16ft) long. For pollack over wrecks or reefs, begin a steady retrieve as soon as the rig reaches the bottom, and continue until the bait or artificial eel is taken, or until it reaches a point about 18m (60ft) up. To establish when you reach 18m (60ft) up, count the reel turns. Continue the procedure until you have discovered the fishes’ feeding level. 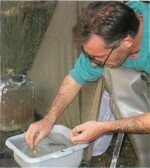 Once you have done this, you can retrieve the trace quickly through unproductive water. For coalfish over wrecks it is usually most effective to work an artificial eel much faster and higher in the water. The instant a pollack or coalie takes, it turns and dives. This is a testing time for your tackle. If you try to hold the fish, you will lose it immediately. You must give line through the reel drag, under pressure. Set the drag precisely to match the breaking strain of your line. There’s no need to strike — the fish’s speed is quite sufficient to set the hook. After the first run is over, work the fish steadily to the surface. In deep water a large specimen will make several more strong runs, each a potential line breaker. In a strong tide, the fish surfaces at least the length of the trace away from the boat and usually a good deal farther. 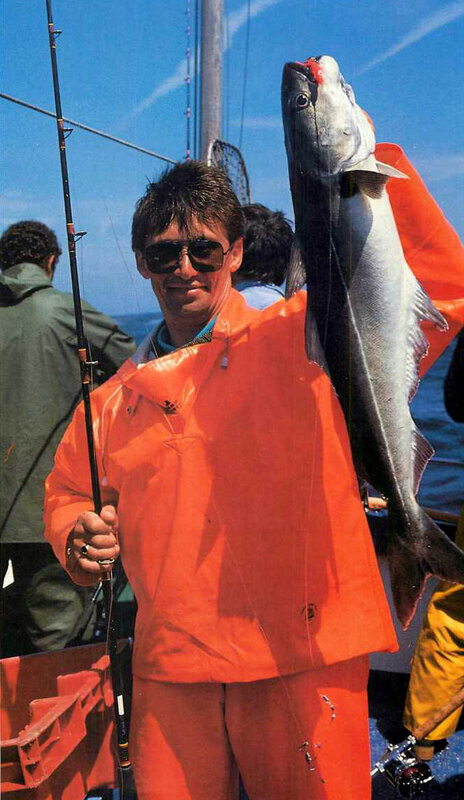 When the boom reaches the rod tip, grab the line and haul the fish in hand over hand towards the waiting landing net. The biggest pollack and coalfish are taken in the English Channel and off Southern Ireland, from wrecks a fair way from land in deep water where, except for short periods of slack about every six hours, there is usu- ally a strong tide run. The best time for them is winter, when they gather over wrecks prior to spawning and the big females are full of roe. Smaller fish can be taken over wrecks all year round. The boat can be at anchor or on the drift. Most long range wreck fishing is from charter boats, and the skipper decides the method of approach. Drifting has the advantage of allowing a considerable amount of the wreckage to be covered. However, most skippers choose drifting simply because it requires nothing more from them than lining the boat up with the wreck and letting the tide take her across. Drifts are started well ahead of the wreck, and the anglers’ lines aren’t drawn up until the boat is well beyond the wreck. Some skippers have the uncanny ability to judge wind and tide with amazing accuracy, and prefer to study the wreck on the fish-finder screen with great care, in the hope of discovering a concentration of pollack or coalfish (both look the same on the screen). Quite often on deep wrecks they congregate over a specific part of the hulk. If so, the skipper then skilfully anchors the boat so the anglers’ rigs work exactly the right spot. Long-trace reef fishing is mainly for small to medium pollack, and usually from an anchored boat. Spring, summer and autumn are the prime seasons, with winter generally poor. The top tempter is a live sandeel, mounted on a 2/0 Aberdeen by threading the hook point through its jaw then nicking it into the flesh just behind its head on the underside. King rag is a very good second and is especially deadly in early summer. By the start of autumn, reef pollack also usually take squid and mackerel strip well, having lost the caution they display for these baits in spring and summer. Reef pollack can be quite difficult to tempt in spring and at times must be literally coaxed to engulf the bait. They touch it, then drop back. It is said that a good pollack angler is born and not made and there is some truth in this. He has a feel for what’s going on below and has the knack of knowing when to slow down and when to speed up the retrieve after getting that first touch. When five sandeel is the bait, it usually pays to stop or even slow the retrieve as the bait dashes around trying to avoid its attacker. If this fails to produce an immediate strike, wind your line in – the chances are the pollack has stolen the bait or blown it lifeless up the line.